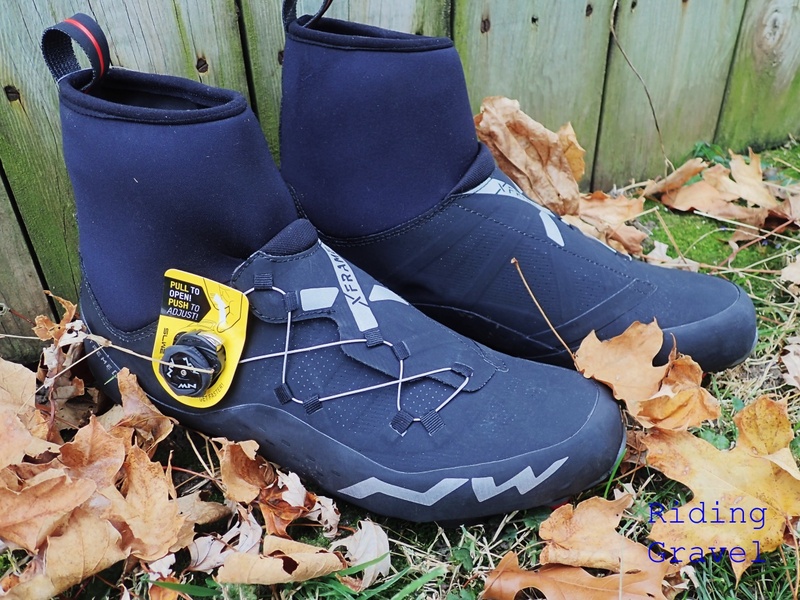 Northwave Extreme XCM 2 GTX Shoes: Getting Rolling – by Guitar Ted Several years ago a “winter oriented company” based in Minneapolis, Minnesota sent out a pair of cycling shoes for me to test which were very unusual at that time. They were kind of a mash-up of a cycling shoe and a bootie, or shoe cover. Instead of two, separate components though, these were melded into one shoe. I was blown away by the concept of this product. It was a brilliant idea, and while this shoe had its shortcomings, the basic intentions were solid. In fact, it wasn’t long before other shoes that were similar started to appear on the market. One such shoe was Northwave’s XCM GTX shoe. It has evolved now to the XCM 2 GTX, and this is the shoe we are going to check out. Much like the predecessors from Northwave and other brands, this is a shoe which mimics the old “bootie over shoe” idea, but now does the job with a single shoe and with much better execution than those that came before. Let’s take a look. The Northwave Extreme XCM 2 GTX shoes. What It Is: The “tweener” seasons of Spring and Fall can be difficult for cyclists. Shoes in particular, which generally speaking, are designed to dissipate heat, become liabilities when the cool winds of Fall blow or the wet grounds of Spring soak your feet. The traditional way to combat this was to simply put an overshoe, or “bootie”, generally made of neoprene, over your Summer footwear. This solution was mildly successful at beast, and downright frustrating at its worst. The hole necessary to allow a cleat to protrude through to enable clipping in also allowed the elements in. Closure mechanisms, generally made with Velcro, would sometimes foul and not work properly. Since the cover and the shoe were not connected to each other, there often was slippage which either fouled pedal engagement or allowed even more air and precipitation or moisture to get in to the foot area. Now we have these “extreme conditions” shoes which have essentially melded the bootie and shoe into one component. The Extreme XCM 2 GTX has a carbon plate inserted at the point where the cleat mounts to increase pedaling efficiency. The Northwave Extreme XCM 2 GTX shoe has a Neoprene upper around the ankle which then becomes a “shoe” at the point where the foot begins. It’s a lot more complex than that simple description though. Essentially the inner part is a material made up of a water- and windproof Gore-Tex® Duratherm membrane. There is also a thermal coating in the toe area. This keeps your feet warm and dry. The foot bed rests inside and on top of this material which lines the shoe proper. This removable foot bed is a sandwich of four-layers of aluminum and fleece construction. Dubbed the “Arctic GTX”, this helps keep the foot insulated on the bottom. The heel cup is integrated for better heel retention as well. Moving to that Neoprene collar now. It is made up of a of Gore Tex “Rattler” membrane which is extremely elastic in nature along with the Neoprene material. This collar is dubbed the “Climaflex Collar” and has a pretty tight opening to help seal it around your leg just above the ankle. The material is also very flexible to allow complete freedom of movement. The upper uses Northwave’s “X-Frame” construction which is apparently a reinforcement that criss-crosses within the “ultralight next generation materials” to help provide efficient energy transfer while remaining comfortable. There are also rubber reinforcements around the shoe to help protect it from abrasions. The odd dial is not what you think it is at first. It is Northwave’s version which is called “SLW2”. It features a little lever which when activated can release the compression of the upper one increment at a time or all at once if you want to remove the shoe. Kind of a “best of both worlds” when it comes to ratcheting buckles and dial activated wire closures. The SLW2 dial is what you twist to tighten the shoe. That little lever? Depress once for incremental loosening, or pull up to release fully for shoe removal. Moving to the sole we can see that there are two toe spikes which can be replaced. The carbon XC 12 Sole has a carbon plate which is there to help increase stiffness for better pedaling efficiency. The stiffness rating on this shoe is “12”, which is pretty stiff, if the shoe was tested true to scale. The TPU tread and plate in the mid-sole allow for traction, walk-ability, and protection from missed pedal entry. I mounted two Shimano Multi-Release cleats to the Carbon insert plate and everything went smoothly. 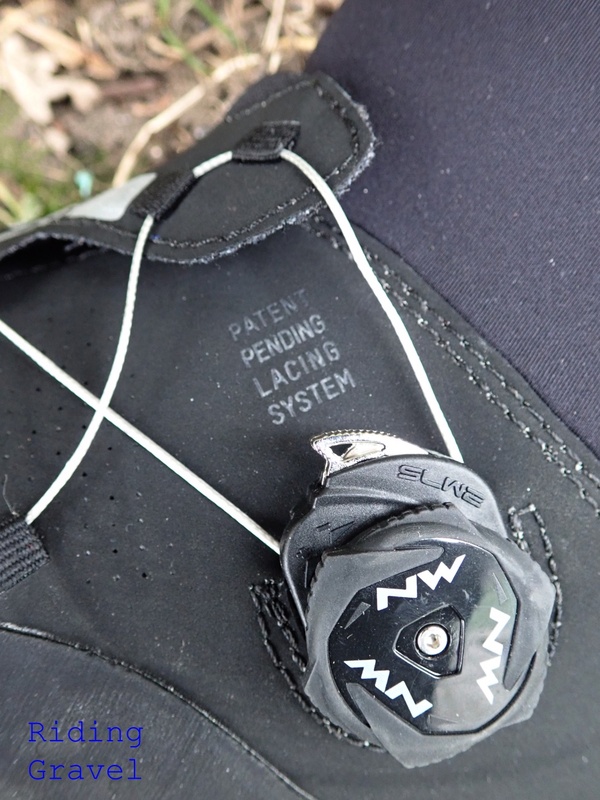 Interestingly, Northwave sent along several warnings to be very careful not to reef on the cleat retention bolts since this will strip the threads in the interface which apparently is not replaceable. So, take heed Hamfist! I weighed the Extreme XCM 2 GTX shoes after cleat installation and got a reading of 1,082 grams for the size 46 that I received to test. First Impressions: Out of the box I was struck by the sleek look of the uppers and the stretchiness of the Neoprene collar. In fact, I was a bit perplexed at first sight of these as to how one would put them on. Once you realize that the inner part is like a sock you stretch over your foot, it becomes readily apparent how too get your foot in there. The pull loop on the collar’s back is key to this as well. Obviously the SLW2 system has to be released fully, which is accomplished by pulling up gently on the little lever located on top of the dial. 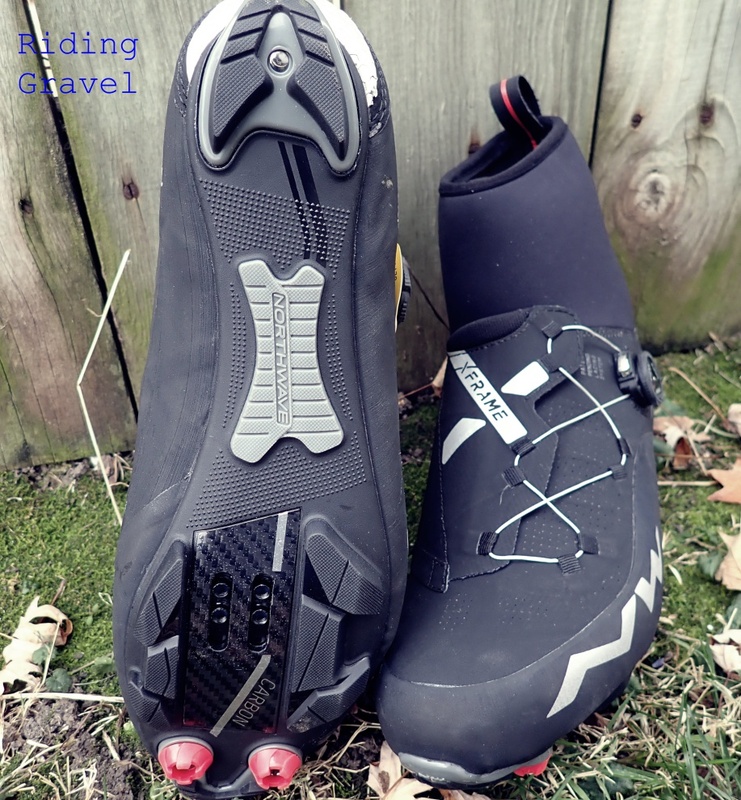 This same lever, when pushed downward, can be used to incrementally release the tightness of the shoe, (I keep wanting to call these things boots), and that is a handy deal since it can be done while riding. Once your foot is in, you can turn the SLW2 dial to your desired level of tightness. 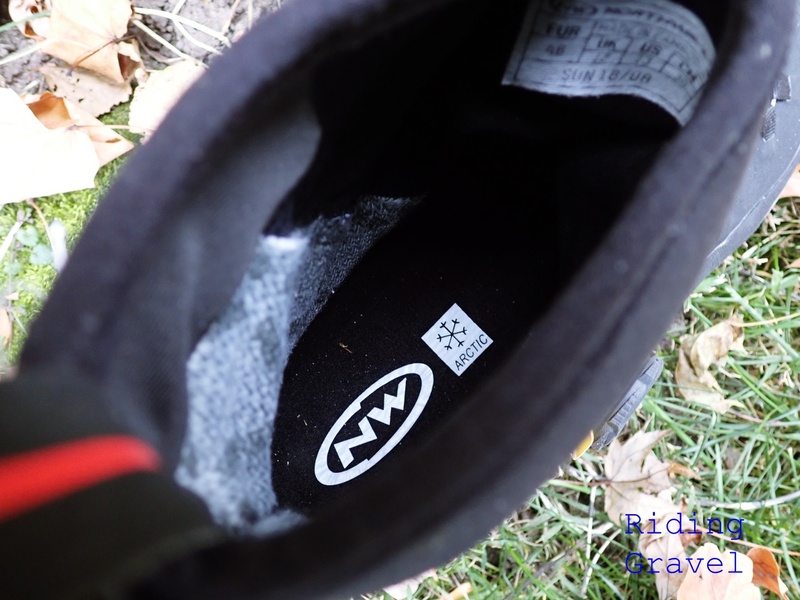 The Arctic GTX footbed was comfortable and can be removed for more efficient drying. I found that the dial worked very smoothly and the action of the “wire” running through its various loops and channels was also unnoticeable except for the tension on the foot as you dialed the system tighter. This pressure was very even on my foot and was not unpleasant in any way. Getting back out just required lifting the lever, pushing the overlapping part of the upper apart, and then pushing the shoe off. It isn’t the easiest shoe to get out of, but if it retains heat and keeps cold and moisture out, I’m willing to put up with a bit of difficulty here. The sensation of walking in the Extreme XCM 2 GTX shoes is one of having your typical stiff carbon soled shoe on. You “clomp” more than walk, but the boot isn’t uncomfortable to walk in. The foot bed is a bathtub shape and cradles the foot well. The collar is quite snug on my skinny ankles. I have to wonder if anyone that has more of a “cankle” type leg might find the Neoprene’s elasticity a bit restrictive at this point. Hard to say….. For me, it wasn’t an issue. The collar is pretty stretchy, so maybe this will not become an issue for anyone. The fit is…….generous? I’ll go with that. I usually wear a size 46 Euro, and in a Shimano shoe, this gets me a spot on fit for my skinny, boat-like feet. Northwave claims on its size chart that a Euro 46 equals a US size 13. Hmm…… Not buying that. If that was the case, the shoe would be far too long and wide for my feet. That is not the case at all, but I think a wider size US 11.5/12 foot will find happiness here. In my case, I have enough room for a thick, wool sock, and to spare, so I am well pleased. I’ve done a “getting to know you” initial ride and everything seems pretty normal so far. 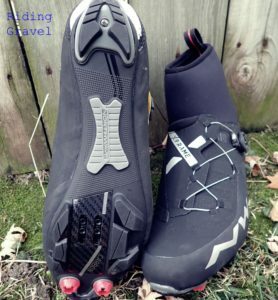 I’ll get out on a few gravel rides and try to mix in a dirt road for fun to see how the Extreme XCM 2 GTX boots…..er, shoes, hold up. Stay tuned for the “Checkpoint” post coming soon. 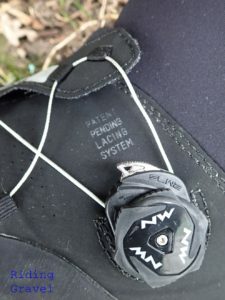 Note: Northwave sent over the Extreme XCM2 GTX shoes for test and review at no charge to RidingGravel.com. We are not being paid, nor bribed, for these posts and we strive to give our honest thoughts and opinions throughout. Guitar Ted hails from Iowa. Home of over 70,000 miles of gravel and back roads. 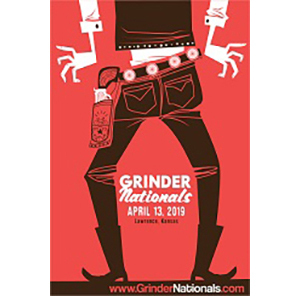 Co-creator of Trans Iowa in late 2004, he has been at the forefront of the growth of gravel events and riding since then. Creator of Gravel Grinder News in 2008, he produced the premier calendar of gravel and backroad events. GT joined forces with Riding Gravel in late 2014.